If you have a business and you want to be a step ahead of the competition, the Internet is the place to be. Nowadays, even individuals have a personal blog or website! So if you want to be found by a larger audience, it’s important that you set up an online store. But for that, you need a web host! The thing is, looking for a web hosting service can be tough, especially when you have no idea where to start. You might be overwhelmed by all the options available to you. Maybe you already have a web host, but you’re looking for something to give your website an extra push. You might want to upgrade your hosting package but you want one that won’t break the bank. Wherever you are along the winding path of web hosting, Dotster can help you out. 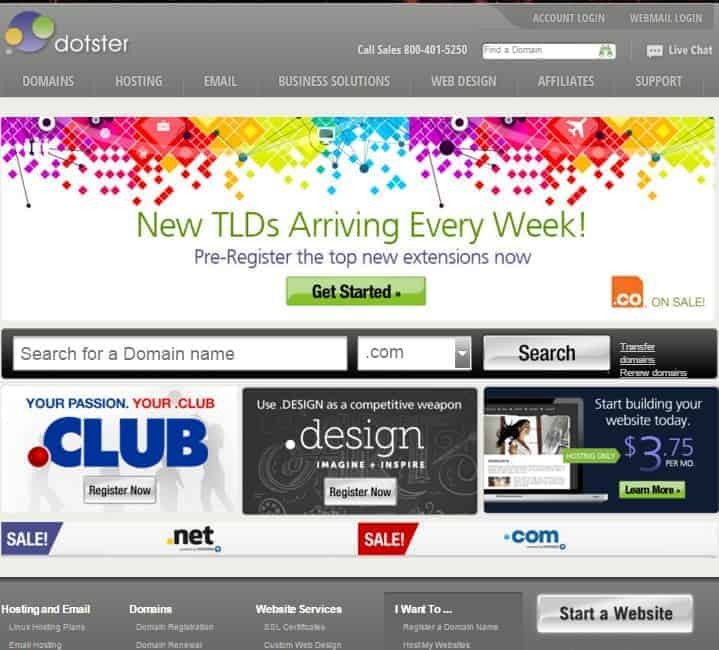 Dotster is a company that’s known mostly as a domain registrar. I know a lot of us have had disappointing experiences with such companies that offer hosting plans when they mostly cater to domain registration, but I have high hopes for Dotster, which is why I decided to make an in-depth review. In this review, I am going to focus more on Dotster as a web host. Besides domain registration, they have many other services that appeal to a lot of web developers and website owners. Their prices are quite competitive, and they even offer both Linux and Windows plans for their shared and VPS hosting packages. Established in the year 1999, Dotster is a veteran in the web hosting scene. They also provide other web solutions like web design services, online marketing, web security, and more. However, there are some clients that have stumbled into some issues while hosting with them. Below, I will reveal the secrets of Dotster’s web hosting services to help you get a deep insight in terms of their plans and pricing, features, reliability and performance, as well as customer support, among others. Dotster offers an assortment of shared and VPS hosting plans to meet any hosting need. They also have both Linux and Windows platforms. All of their hosting plans offer unlimited disk space and scalable bandwidth, as well as a drag-and-drop website builder, DNS management, web analytics tools, PHP5 services, and Perl/Python, just to name a few. 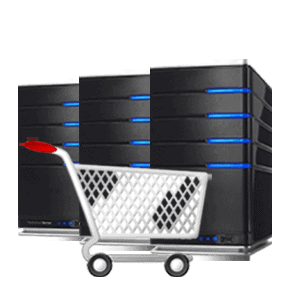 Their hosting services are offered in three different tiers. 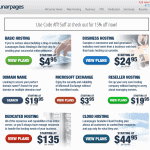 They provide good value for money and you can select from many affordable hosting options. Dotster offers a choice between Linux- and Windows-based servers, through which you can choose from three different tiers: Basic, Deluxe, and Ultra. Choosing a plan depends entirely on your needs and preference. Both operating systems (OS) are reliable and offer the same levels of stability and security. The main difference between a Linux and Windows plan is the pricing, with Windows hosting costing slightly more per month. There’s also a slight difference between the number of FTP logins, as well as some features like free cloud storage and premium customer support. Depending on your chosen plan, you can look at spending as low as $3.75 per month up to $14.75 per month. The Linux platform is more popular than its Windows counterpart because of its security and stability. Because it supports a lot of free and open source apps, it’s the ideal option for web developers and designers, or for anyone who wants to use open source programming languages like Perl, MySQL, and PHP. What’s more, the Linux platform allows you to easily protect directories with passwords and set permissions. With Linux hosting, you can choose from three tiers: Basic, Deluxe, and Ultra. You can opt for a 1-year, 2-year, or 3-year contract for any of these packages. With the Basic hosting plan, you’ll get 1 hosted domain, unlimited disk space and subdomains, scalable bandwidth, and 100 email accounts. The number of email accounts is considerably higher compared to other web hosts. It even trumps BlueHost, which is one of the best and most reliable web hosts you can find in the market today. Meanwhile, the Deluxe plan builds upon the Basic hosting plan, except that you can host unlimited domains and get 250 email accounts. Right now, you can get this plan for only $6.75 a month, which is 15% off from its regular price of $7.99 a month. You’ll get the best value by purchasing this plan so you better hurry before the sale ends! If you want a more powerful hosting package, you should go for Dotster’s Ultra hosting plan because everything is unlimited, including the number of email accounts. You can also save up to $24 a month on Premium Support. Neat! All Linux hosting plans come with 1 GB worth of FREE cloud storage and an easy-to-use drag-and-drop site builder. Windows is the most popular OS in the world. However, it’s not necessarily the most widely used platform in web hosting. But for those who prefer to build their site using one of Microsoft’s programming languages (such as ASP or ASP.NET), Dotster gives you the option to choose Windows hosting. It’s the best choice if you want to use many of Microsoft’s applications. Just like Linux hosting, you can choose from three different plans: Basic, Premium, and Ultra. Prices are the same for 1-year, 2-year, and 3-year contracts. Compared to Linux hosting, however, the Windows hosting plans are more expensive by a dollar. It also provides unlimited disk space and scalable bandwidth, as well as a free website builder and web analytics tool. Basically, the Windows hosting plans come packed with the same features as in Linux hosting plans, except that there’s no free cloud storage. If you opt for the Windows Premium plan, however, you’ll receive unlimited FTP logins, as opposed to the Linux Premium plan, which is limited to just 25 logins. If you choose the Windows Ultra hosting plan, you’ll get Premium Support for FREE. I also like the fact that Dotster offers free ASP applications and components such as aspJPEG, aspPDF, aspEncrypt, etc. Looking to get your first domain for free? You’re in luck because Dotster currently has a limited-time offer where you can get one free .com, .org, .info, .net, .biz, or .us domain registration for a whole year by purchasing any of the shared hosting plans. Simply use the FREEDOM15 promo code and you’ll get your first domain for free for the initial term. Take note, however, that this promo code is not valid with existing domains and services, as well as renewals, other coupons, or special pricing. Dotster has feature-rich shared hosting plans at competitive prices. They can even compete head-to-head with other big-name web hosts like BlueHost, iPage, and eHost. Their entry-level plans are a good choice for individuals and small business owners who are new to website building. Are you anticipating business growth? You need a bigger hosting plan to expand your website. Dotster offers standard Linux-based VPS hosting plans that are tailored to the needs of web developers and business owners. Whether you’re looking to upgrade your hosting from a shared account or you need the power of a (virtual) dedicated server, Dotster has a VPS plan in place to help give your sites and/or apps the edge. Dotster offers three different tiers: Standard, Pro, and Premium. At $29.70 per month, you can get the Standard VPS plan which comes packed with 512 MB dedicated RAM, 20 GB disk space, and 1000 GB monthly data transfers. The Pro plan builds upon the Standard plan, but with 1024 MB dedicated RAM, 40 GB disk space, and 1500 GB bandwidth. On the other hand, the Premium plan has 2048 MB worth of dedicated RAM, 60 GB disk space, and 2000 GB bandwidth. All of the VPS plans come with unlimited domains, MySQL databases, and mailboxes. And just like the shared hosting packages, a website builder comes included in the package. And if you purchase the Pro or Premium plan, you’ll also have access to a user-friendly cPanel/WHM control panel for creating and managing your site(s). As you can see, Dotster offers plenty of unlimited features in their VPS hosting plans. But if you compare it with the competition, you’ll see a stark difference between the offers. For example, with BlueHost, you’ll get much more storage space, RAM, and bandwidth at cheaper prices. Good thing Dotster doesn’t charge setup fees, plus they’ll give you your first domain for FREE if you use the FREEDOM15 coupon code, which is a limited-time offer. Take note that this promo expires on December 31, 2015 (the same applies with shared hosting plans), so you better act now! Are you expecting site growth and are anticipating high-traffic volumes? Unfortunately, Dotster doesn’t offer dedicated hosting plans, which is ideal for large businesses that require a higher level of security and performance for their website(s). If you want to go for a dedicated hosting package, it’s best to look for another web hosting provider. Dotster offers a number of web solutions that are tailored to help turn your small business into a fierce competitor in the World Wide Web. One of this is their eCommerce hosting package. Their eCommerce hosting package is the perfect solution for small businesses that require the security, performance, and power of a dedicated server – minus the expensive price tag. 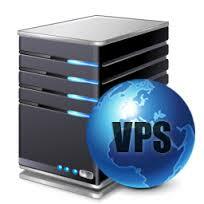 The package comes with a domain registration and VPS hosting plan. You can get Dotster’s eCommerce hosting package starting at $29.70 a month. Other business solutions offering by Dotster include SEO Marketing, Local Site Promotion, and Email Marketing. Blogging isn’t just for sharing your thoughts, ideas, hobbies, and interests. Now, you can even use it as a means to promote your business online! It’s simple and easy; and when updated regularly, can help you rank high in search engine pages. We all know that WordPress is the leading blogging platform and content management system (CMS), so why not use it to propel your business beyond the competition? It’s extremely user-friendly, and it comes with free themes and plugins to give your blog a professional look and to further expand its functionality. If you still don’t have a blog with them, then you’re missing out on a lot of great opportunities! Unfortunately, Dotster doesn’t offer managed WordPress hosting packages. 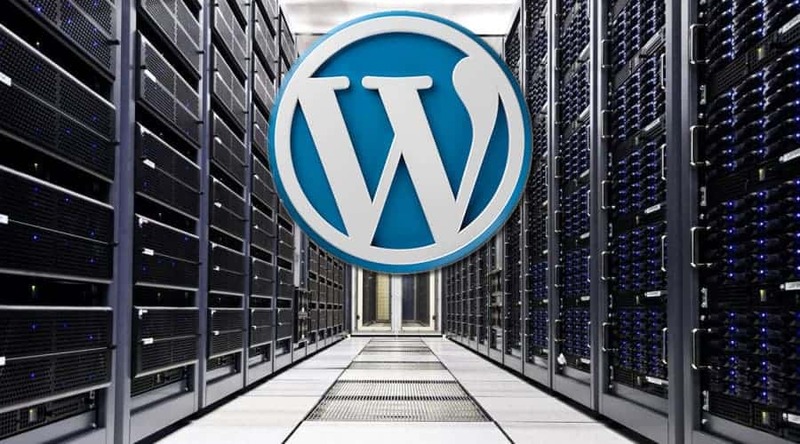 But that doesn’t mean you can’t transfer an existing WordPress site or create a new one with this web host. In fact, you can easily install this free open source application in any of Dotster’s web hosting plans. Besides WordPress, you can also quickly install other popular CMS like Joomla and Drupal via MOJO Martketplace. What I Love – Create a Basic Site in Minutes with Instant Website! Dotster’s hosting plans may already come with a handy website builder but if you want more features, you might want to give Instant Website a shot. With it, you can create a basic yet professional-looking website in just a matter of minutes. With the Instant Website site builder, you can easily create a one-page site with a modern layout and SEO-friendly website template. It’s a user-friendly and intuitive tool that requires no technical knowledge to set up. It’s the ideal solution for personal and small business use, as it already comes integrated with widely known social media tools. It even comes with an integrated map and image gallery. 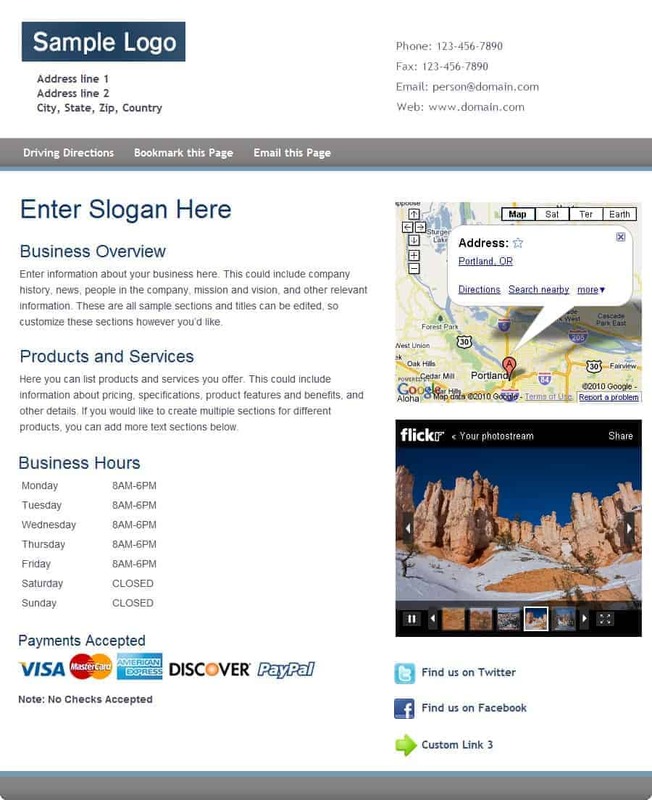 With it, you can list your business hours, add contact information, payment methods, and more. Not sure if Instant Website is the right tool for you? Dotster lets you test the waters with a free 30-day trial! If you like this site-building tool and you wish to continue using it following the free trial period, you can get it for only $2.99 a month. And if you wish to cancel your Instant Website within the 30-day trial, you can do so without charge. So why not give it a try? There’s nothing to lose! Unlike many web hosting providers out there, Dotster does not provide cPanel access to those who opt for a shared hosting plan. Instead, they’ll get a web-based control dashboard, which isn’t all that bad, really. It’s simple and straightforward, though not exactly the most appealing if you need more advanced features and options. Those who use VPS hosting, however, can expect their very own cPanel control panel, as well as access to WHM. The layout and navigation of the control panel is simple and straightforward, with tab and sidebar navigations. 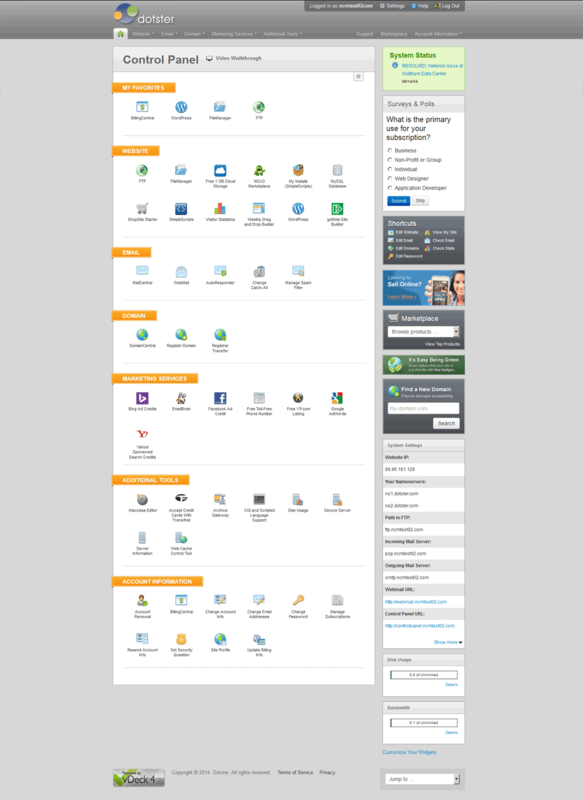 The menu icons make it easy for you to find what you need, although they are much smaller than what you’d usually find in other custom cPanel control panels. Overall, account management is a breeze. You have access to all tools and options for creating email accounts, managing domains, creating databases, as well as installing and using numerous applications and scripts. You can even check and manage billing information from the “Account Information” section of the cPanel. Installing your favorite applications and scripts is easy because Dotster uses the ever-popular automatic one-click installer, SimpleScripts. With SimpleScripts, you can install more than 70 of the Web’s top apps, including WordPress, Drupal, Joomla, b2evolution, Gallery, and more. You can also install a simple and worry-free drag-and-drop site builder tool called SiteBuilder, which takes the hassle and chore out of getting your site up and running. Besides these, you can also add apps that will harness the power of user-generate content. This includes phpBB and phpFreeChat. With these interactive apps, you can make your site visitors keep coming back for more. If you want to make the online shopping experience more convenient for your customers, you can add the OSCommerce shopping cart or CubeCart app for backend order and product management. And if you’re looking to share valuable information and want to collaborate with other people to boost productivity and generate new ideas, SimpleScripts also lets you install apps like TikiWiki, MediaWiki, and WikkaWiki. There’s an app or two for everyone, and it couldn’t be easier to add them to your site with SimpleScripts. It’s definitely a must-have for personal and small business websites. SimpleScripts is available on their Dotster’s Linux hosting plans. Dotster doesn’t have any reference on their uptime guarantee, and I wasn’t able to find any uptime stats on their website. But from the research I have done, it doesn’t look like their clients are complaining about downtime issues. It seems to me that they’re doing quite well in this area. But let’s not get ahead of ourselves and sign up with them right away. Take note that response times for servers is measure in milliseconds (ms). A server that responds in less than 20 ms is considered to be fast. If it responds in 21 to 50 ms, it’s still okay. But if it goes beyond 51 ms, it’s already considered to be slow. Upon conducting a test, I’ve found that Dotster have a response time of 14.99 ms. The last time it was down was over a week ago, but the response time seems to be quite impressive. As per the site’s terms and conditions, Dotster clients can expect a 30-day money-back guarantee. You can try out their hosting services completely risk-free within the first 30 days and if you’re not satisfied, you can cancel your account and Dotster will give you your money back in full. But as with any other web hosting provider, the money-back guarantee doesn’t include fees for add-on services like domain registration. If you register a free domain through Dotster, there will be a non-refundable $15 fee should you wish to keep your domain. This not only covers their own costs, but also ensures that even if you’re not pleased with their services, you won’t lose your domain name. If you wish to cancel your account, you are free to transfer it or just point it elsewhere. Also, take note that the money-back guarantee only applies to credit card payments. Processing payments using other methods often come with a cost, so Dotster is currently not able to offer the money-back guarantee for other payment methods at this time. Dotster has a friendly support team available to help you 24/7 in case you need assistance with your hosting and online presence needs. They provide a number of options for you to contact them: telephone, email, and an online ticket submission. There doesn’t seem to be a live chat system, which could have been a good option should you need immediate help. I went to test out their telephone support. It took nearly 10 minutes of waiting on two different occasions before a customer rep answered my call. This is a slightly longer wait time compared to other web hosts I’ve tested, but it’s not the worst there is. As for their ticket system, you can only submit one if you’re already an existing customer. 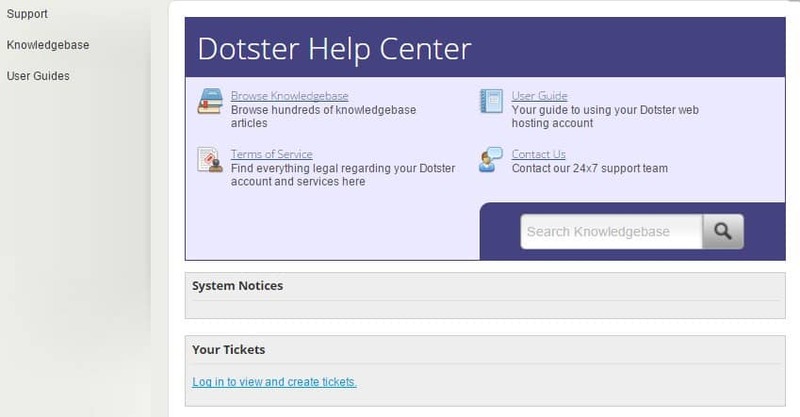 I did some research and found that some customers complained that Dotster doesn’t respond to their tickets in a timely manner, which is a bit disappointing. It seems that it’s common for them to take 2 to 6 days on average to respond to a ticket submission (and you can expect more delays if you submit a ticket over the weekend). So if you’re in an emergency, it’s best to stick with telephone support. The ticket submission issue aside, there are a few strong points to this web host’s customer support. For example, if you need a quick solution to a common problem, you can check out their extensive knowledgebase and user guides, where you can find useful video tutorials and how-to’s. If you think you need frequent customer support, you can expect to find great support that you can trust with BlueHost and iPage. I personally use both of these web hosts myself, and based on my personal experience, I can say that their customer support staff are knowledgeable and can be trusted. The benefits definitely outnumber the drawbacks, but it’s not to say that Dotster is the best and only option you have out there. Before planning to purchase a hosting plan with them, make sure to do your homework first by checking out reviews about other top web hosts, and comparing them with Dotster. Dotster is a viable hosting service that’s ideal for individuals and small business owners who are in need of a budget-friendly hosting package. However, they don’t really stand out from the competition because of some issues with performance and customer support. They could also improve considerably if they added more features to their plans and address the issues related to customer support. I really feel Dotster needs to add live chat support because many clients will need someone to talk to if they have issues with their hosting account. They seem to really get a lot of negative feedbacks in this area so I’d be happy if they re-evaluate them and address the problem as soon as possible. Other than this, the company has what you need if you want a standard and stripped-down web hosting option for building a small and simple website. If you’re in need of a more comprehensive web hosting solution, however, other web hosts have far more to offer in terms of feature sets and customer support. Even with mixed reviews from premium plan users, they still offer one of the cheapest web hosting services in the internet. This company is awful! I had 3 domains I purchased and had them on manual renewal so as NOT to automatically renew. The card they had on file was compromised and replaced with a new card and new number 2x but they somehow still managed to charge the card not only for the renewal but several other charges. I called my bank after trying to work directly with Dotster customer service and they are now filing fraud charges and I have to go through the hassle of another new card. Dotster have withdrawn from me money for service which I didn’t order.